Auto Collision Specialists Profiled in Hammer & Dolly Magazine! Learn more about Auto Collision Specialists in this great new article! How and when did Chuck and Carey start the business? How important is family to this multi-generational body shop? How have things evolved over time and what does the future hold? Read more below! 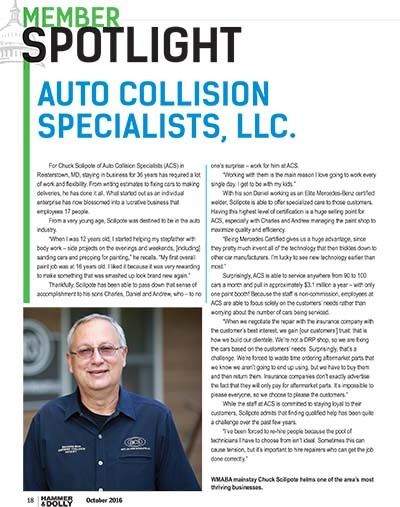 For Chuck Scilipote of Auto Collision Specialists (ACS) in Reisterstown, MD, staying in business for 36 years has required a lot of work and flexibility. From writing estimates to fixing cars to making deliveries, he has done it all. What started out as an individual enterprise has now blossomed into a lucrative business that employees 17 people. In addition to hiring only the most qualified technicians, ACS is able to sustain its success by staying up to date on everything that is going on within the industry, including all the high-tech electronics that are now being put on all cars.